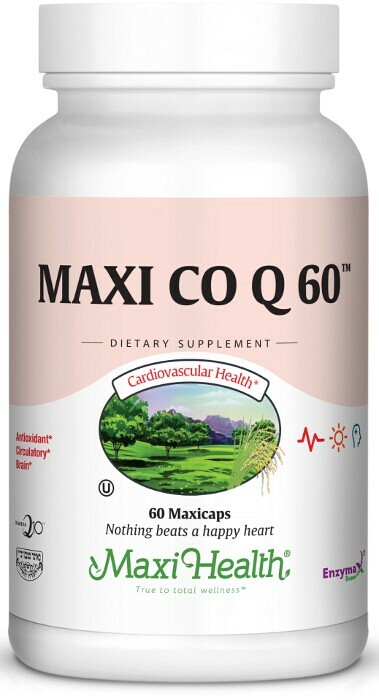 If you have been thinking about taking Coenzyme Q 10, consider Maxi Co Q 60™. Co Q 10 is a fat-soluble vitamin-like substance found naturally in all forms of animal life. It is biosynthesized in the membranes of cells in humans and is vital in the production of energy. It is found in most cells, with especially high concentration in the heart (the organ that requires high levels of energy for normal operation). If that wasn't enough, it’s an antioxidant as well. Try Maxi Co Q 60™ today! Take one (1) Maxicap™ once or twice daily, or as directed. This product contains no animal products, wheat, gluten, salt, sugar, milk, yeast, artificial flavors, colorings or preservatives. Kaneka Q10™ is a trademark of Kaneka Corp.